Considering Animals draws on the expertise of scholars trained in the biological sciences, humanities, and social sciences to investigate the complex and contradictory relationships humans have with nonhuman animals. 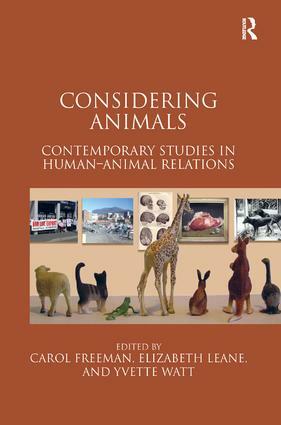 Taking their cue from the specific 'animal moments' that punctuate these interactions, the essays engage with contemporary issues and debates central to human-animal studies: the representation of animals, the practical and ethical issues inseparable from human interactions with other species, and, perhaps most challengingly, the compelling evidence that animals are themselves considering beings. Case studies focus on issues such as animal emotion and human 'sentimentality'; the representation of animals in contemporary art and in recent films such as March of the Penguins, Happy Feet, and Grizzly Man; animals' experiences in catastrophic events such as Hurricane Katrina and the SARS outbreak; and the danger of overvaluing the role humans play in the earth's ecosystems. From Marc Bekoff's moving preface through to the last essay, Considering Animals foregrounds the frequent, sometimes uncanny, exchanges with other species that disturb our self-contained existences and bring into focus our troubled relationships with them. Written in an accessible and jargon-free style, this collection demonstrates that, in the face of species extinction and environmental destruction, the roles and fates of animals are too important to be left to any one academic discipline. Contents: Foreword, Marc Bekoff; Introduction, Carol Freeman and Elizabeth Leane; Part 1 Image: Contemporary art and animal rights, Steve Baker; Marching on thin ice: the politics of penguin films, Elizabeth Leane and Stephanie Pfennigwerth; The traumatic effort to understand; Werner Herzog's Grizzly Man, Undine Sellbach; Naming and the unspeakable: representations of animal deaths in some recent South African print media, Wendy Woodward; Possum magic, possum menace: wildlife control and the demonisation of cuteness, Kay Milton. Part 2 Ethics: Pleasure's moral worth, Jonathan Balcombe; The nature of the experimental animal: evolution, vivisection and the Victorian environment, Jed Mayer; 'Room on the ark? ': the symbolic nature of US pet evacuation statutes for nonhuman animals, Marsha L. Baum; Making animals matter: why the art world needs to rethink the representation of animals, Yvette Watt. Part 3 Agency: The speech of dumb beasts, Helen Tiffin; Extinction, representation, agency: the case of the dodo, Carol Freeman; Cetaceans and sentiment, Philip Armstrong; Zones of contagion: the Singapore body politic and the body of the street-cat, Lucy Davis; When is nature not?, Tim Low; Bibliography; Index. Carol Freeman is a Research Associate in the School of Geography and Environmental Studies at the University of Tasmania. Elizabeth Leane is a Senior Lecturer in the School of English, Journalism and European Languages at the University of Tasmania. Yvette Watt is an Associate Lecturer in Fine Arts at the University of Tasmania.